Been taking the back seat this last few weeks, about 6 weeks of silence on the Aquaponics front. All is well just decide to let plants grow and halt all experimenting for the time being. I want to see the plants grow, and its slow.. with the heat and all. Those growbed outside are flourishing with growth more than I could handle. Corriander and Yam over spilling the tub, its very hot these last few weeks and water in the fish tank dried up very fast. Most of the fish that was here I had transferred to the main tank and just left a few to take care of the plants needs. On the main tank growbed growth over spilling too, covering the fish tank access. Its okay, I am not harvesting those fishes yet till after Christmas. That shade that I did helps a bit on these dry spell and I would expect the worst to come this next 2 months. Evaporation on the main tank is significantly less, maybe due to the overgrowth. Mint and Asparagus fighting for space, I just let them be. The Asparagus is not big and so far its survived. 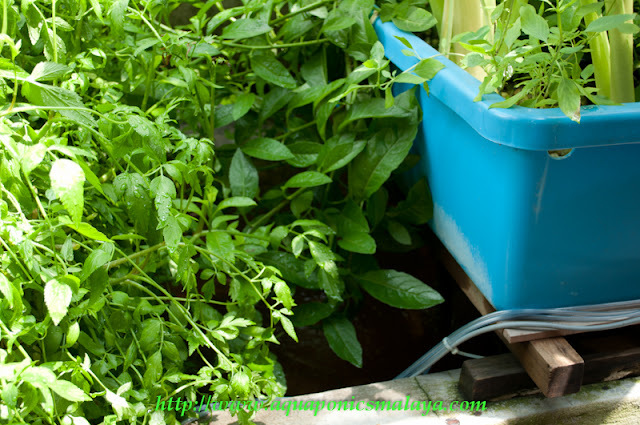 When ever you don't have time or any specific plant to grow, try Mint first.. these will ensure you have plant to take care of the biological process and then you get the more serious plant to try. 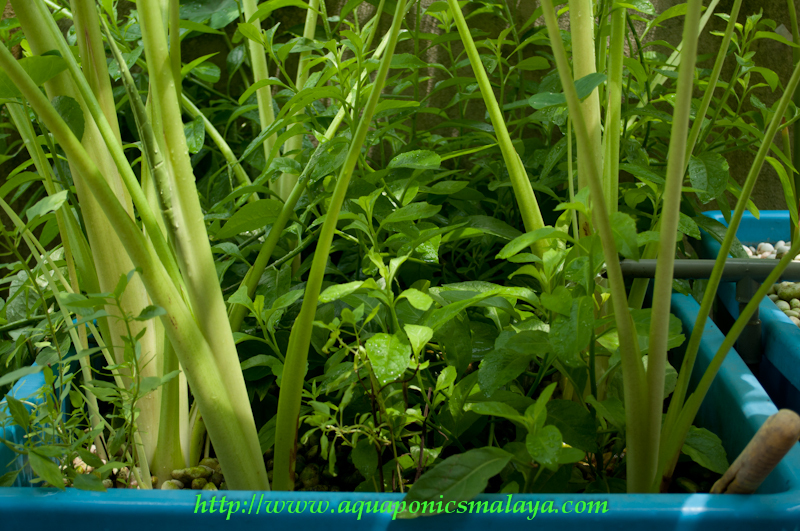 Another growbed of Yam, I like this plants since its so fast in multiplying and provide plentiful source of vegetable for the kitchen. The system running without problem and I just feed the fish to keep them happy. The plants are doing great on their own. Looks like everything is going well for you Affnan! 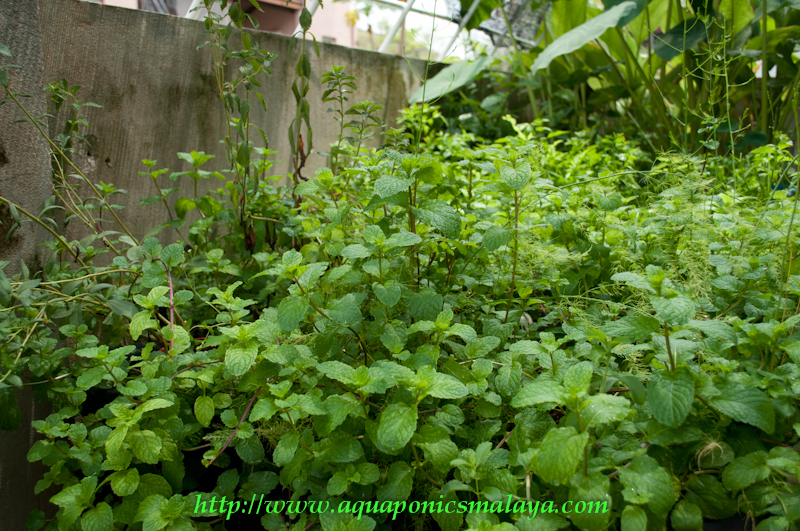 Do you notice that the mint we plant has way stronger scent than any other we find? 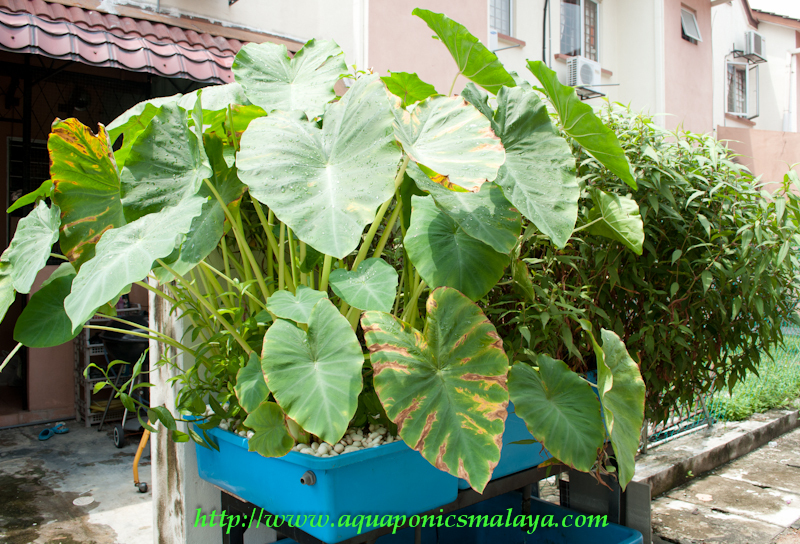 I think it really loves the aquaponic environment. My mother-in-law to be just kept asking for more so now I have 6 pots of mint instead of one. I really love them in my tea! Cheers! Thanks Guys, Nak menulis tu yg sangat susah. Time is not on my side now. Been very busy lately appointed as Aviation Assessor on top of my current job, occasionally kena musafir di Putra Jaya to help out. I did Yusuf, occasionally I trim everything down and gave it away. My neighbour can take as they want to use it, but still its growing more than what we can consume. 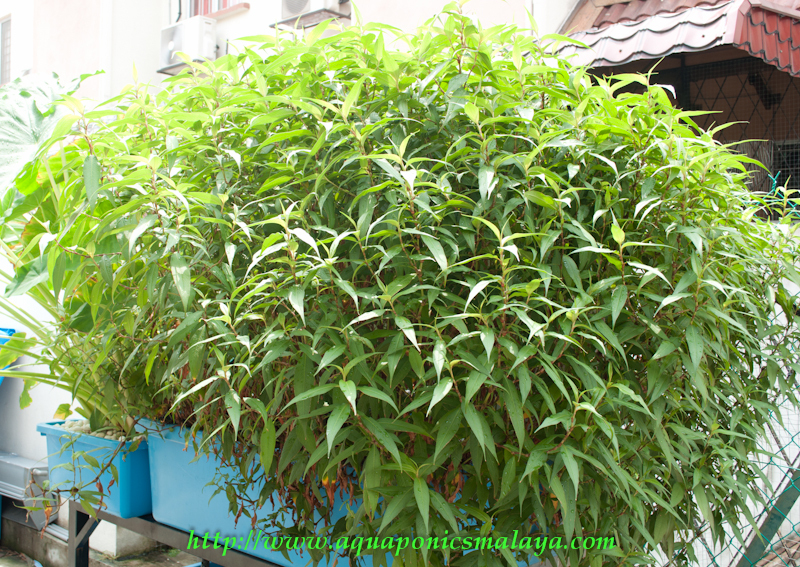 I'm just new to Aquaponics system, I intend to have a fish tank (1500 litres). I'm going to follow your ratio 1:1. I have a few questions and I hope I can find answers from you. 1. 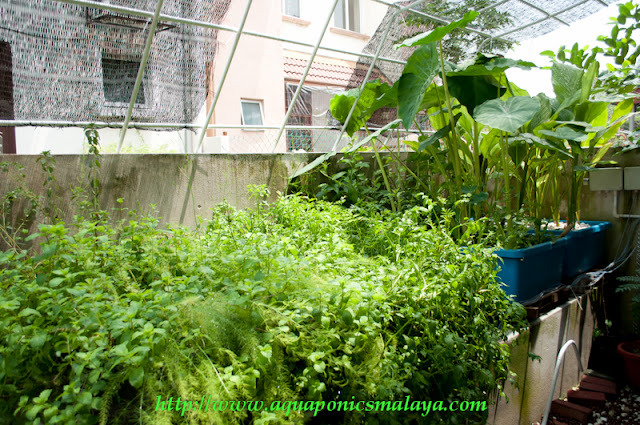 You talked about maturing of the grow bed. How long it takes to mature it? 2. How many litres of water I going to use to cover the starting of all the need of the system? 3. 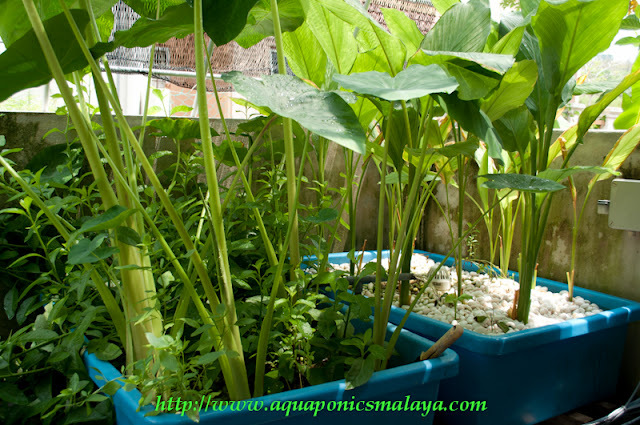 Why do you use many small grow beds instead of using big ones? 4. I'm going to use gravel, do I have to wash them before using it? 5. I read all your blog from A~Z (took me 10days), you didn't mention how many the fish food cost you a year? Is it worth equal to your harvest? 6. What's the best plants to start with and can mature the grow bed faster? I did try to contact you on facebook and other ways, unfortunately cannot get you. Hi Asraf, thanks for the question. I've been very busy lately with work. 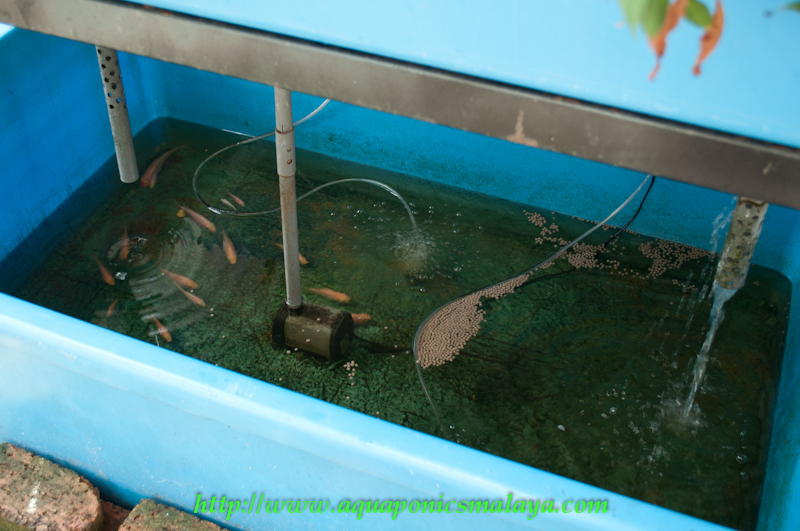 This stop me from doing much on Aquaponics. However the plants in my backyard still flourishing with minimal care. 1. Take about 45 ~ 60 days. 2. 1500 lt fish tank, you will need that amount. 3. Its easier and readily available, bigger may be difficult to work on. 4. Don't need to wash, the 45 ~ 60 days will take care of that, but if you want to clean its ok.
5. use about 2 and a half bag of feed a year for my setup.. each bag cost me RM 60.00, the fish harvest in the region of RM 300.00 if I sell them retail, I normally I gave them away. The veg I don't measure any. 6. 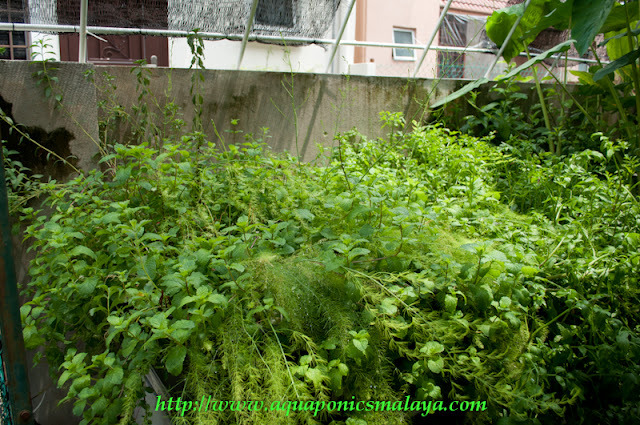 From day one try simple plants, like Mint, Kesum, Selom, Keladi, Kunyit. They will get thin but don't worry they will not die. Hi Affnan. You're really doing great with your aquaponics system. Keep it up and Goodluck. well done what an interesting stuff!!! keep it up and im looking forward to learn abt this . Anyway is that kunyit or turmeric plant in the last pic? Pls ignore the last question - it is kunyit :). Just discovered this blog and got excited about it. Keep it up!